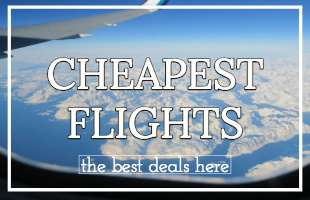 Looking for lots of vegan options at cheap prices (at least compared to the West)? Come to Budapest!! 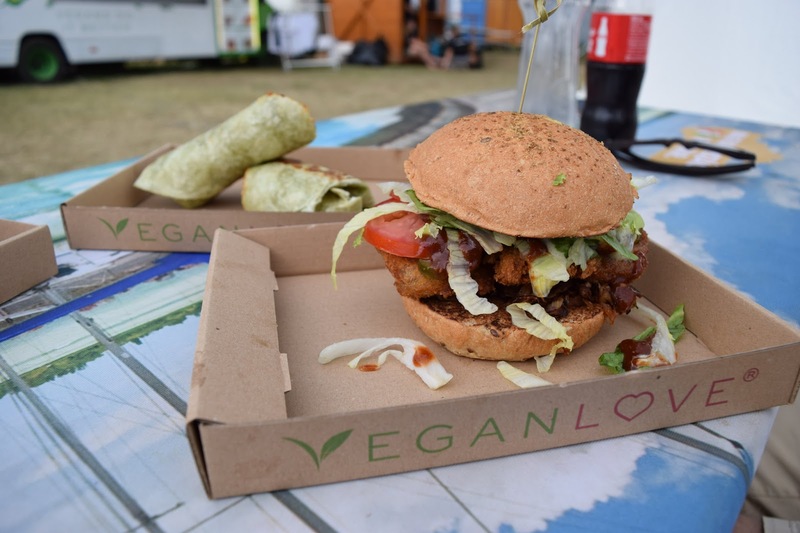 With over 23 vegan restaurants to choose from, you might feel a little overwhelmed with the choice. Don't worry, I am semi-based in Budapest, I have a lot of Hungarian vegan friends and I know the places you're going to love. To read full reviews of these places, scroll down. NB: All these meals will fill you tf up. Las Vegans is usually the first Budapest vegan restaurant I take visitors to. Why? 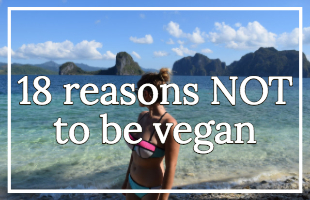 Because they have some of the best vegan burgers I've ever had. Scratch that, they have some of the best burgers I've ever had - vegan or otherwise. I've taken multiple meat-eaters here, all of which have sung the praises of this place very highly (and returned with other meat-eating friends). My personal favourite is the Forest Burger - made with mushrooms and served with caramelised onions and sun-dried tomatoes. The texture is perfect and the taste is delectable. If you go on a Wednesday the Forest Burger comes with a free drink or wedges. Las Vegans mainly specialise in burgers, but they also do wedges, drinks and have just branched out into pizzas. Opening Times: Every day 11.30am-11pm, (and We - Sa they're open until 1am). Napfényes Étterem is usually the second place I take vegan Budapest visitors. I think it's one of the best Hungarian restaurants in Budapest. If you're looking for traditional vegan food Budapest this is the place to go. And even if you're not, this is still the place to go - all of their dishes are delicious, alongside traditional Hungarian dishes they also offer Asian dishes, faux cheeses, cakes and pizzas. My personal recommendations are Meggyleves Hidegen - Cold Cherry Sour Soup, Grilltál - Grill Platter and Hamis túrógombóc szójajoghurtos öntettel - Faux Cottage Cheese Dumplings. These are all traditional Hungarian dishes and are yummy in their own rights. Need more reasons to visit Budapest? Check out my other blog. Istvánffi Veggie Burger makes incredibly delicious fast food burgers and fries. It's my favourite vegan junk food Budapest restaurant. The taste and texture are reminiscent of McDonald's (I like to call them MockDonalds), but there's a key difference: it tastes a billion times better than McDonald's. The texture is absolutely perfect (I always go for the mushroom, but they offer wheat and oatmeal as well). I've always found Vegan Love to be a bit hit and miss, but because their hits are so great, I still rate them as one of my favourite Budapest vegan restaurants. 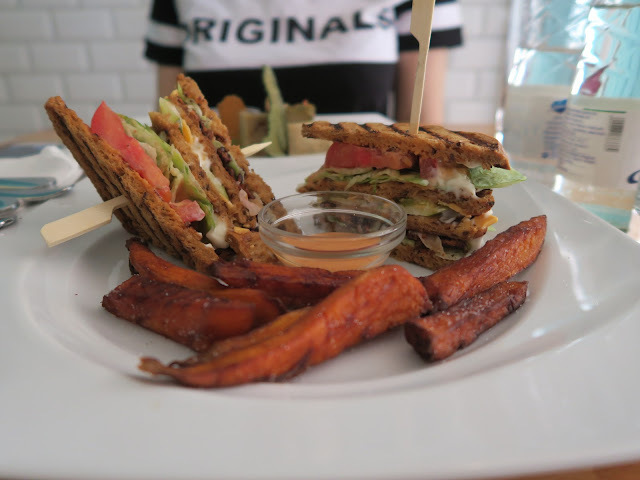 My absolute favourite thing to eat there (which I could literally eat every day for every meal) is the BLT sandwich - the crispy vegan bacon is so tasty, the texture so crispy, I'd even go so far as to say that it's better than bacon (take that haters). The veganaise is organic soy and tastes like angel juice. They also do burgers and other sandwiches. Like Vegan Love, Vegazzi is a bit hit and miss, but like Vegan Love, the hits are incredible. All of the pizzas are made in authentic Italian style - aka in a real pizza oven, aka they take ages (aka that's how you know the pizza is going to be good). In my opinion, these are, by far, the best vegan pizzas in Budapest. Another advantage is its location: set in famous ruin bar Anker't you can tick off two vegan travel goals at once: eating vegan pizza in Budapest and drinking cheap beer in a ruin bar. A disadvantage of the location is that Vegazzi doesn't have waiters that bring your food to the table, you have to wait until you hear your number being called. This is true of most outdoor places in Budapest, the difference here is because it's a pub setting you might not hear your name being called. And they don't care, so if you don't go when called your pizza will be cold. I'm not the biggest fan of their vegan cheese, but their mushroom pizza is incredible. The mushroom pizza is kind of soggy, and I know that doesn't sound great, but trust me, it really is. Great Bistro is a great place to go on a cute daytime date or for a special occasion. The decor is sweet and the staff are friendly. 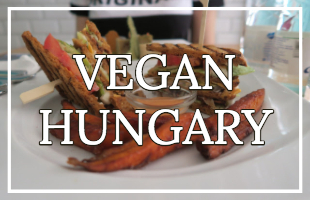 This place is a bit more expensive than your average Budapest vegan restaurant (hence why I recommend you go there for a special occasion). It is probably the most central Budapest vegan restaurant though, so that is, of course, a great advantage. I've tried their Club Sandwich and their Cheese Plater. The cheese plater features vegan cheeses from Say Cheez Raw, aka my favourite vegan cheeses in Budapest. Say Cheez have their own restaurant (see below for full review), but as Great Bistro has a much more central location, you might be better off going there. At Great Bistro, the cheese plater comes with grapes, sweet pea leaves, crackers and chutney. Whilst the vegan cheese is out of this world, I was less impressed with the rest of the plate. And at 3400 HUF, a couple of bread rolls would have been great. Saying that, I was really full after this plate, so maybe bread rolls would be too much. I love Great Bistro's club sandwich (2700 HUF): The mayo tastes like original egg mayo (aka dope), the bacon is incredible (almost as good as Vegan Love's), the green apple and tomato worked really well, and the sweet potato fries on the side were salty and smokey. Conclusion: yum. Nearby Sites: Hungarian Parliament, Saint Istvan Cathedral, Cat cafe etc. 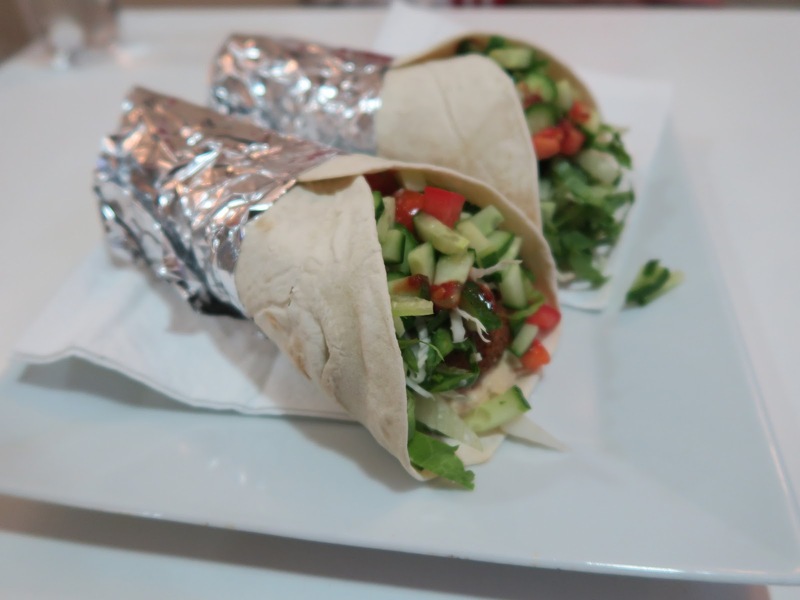 Falafel Sziget is a no-frills place that does really great falafel and hummus. The staff are polite and the falafel sandwich is filling and yummy. Highly recommended if you need a quick (cheap) bite to eat. Say Cheez Raw make raw vegan cheeses from cashews. They have an abundance of different flavours from garlic to Italian, sun-dried tomato to charcoal (my personal favourite), and, of course, paprika (Hungary's personal favourite). They always make an appearance at Budapest's monthly vegan market, where I always make sure to buy at least one cheese. It took me almost a year to actually make it to their restaurant, which is a cute joint that seats about four people. Here you can try a cheese plater or a sandwich. I went for the cheese plater. Whilst I love their cheeses I wasn't overly impressed by the other parts of the plater, thus I recommend you go there and indulge on cheeses (or try the sandwich). Opening Times: Tu - Fr 11am-6pm, Sa 10am -1pm, Su, Mo closed. 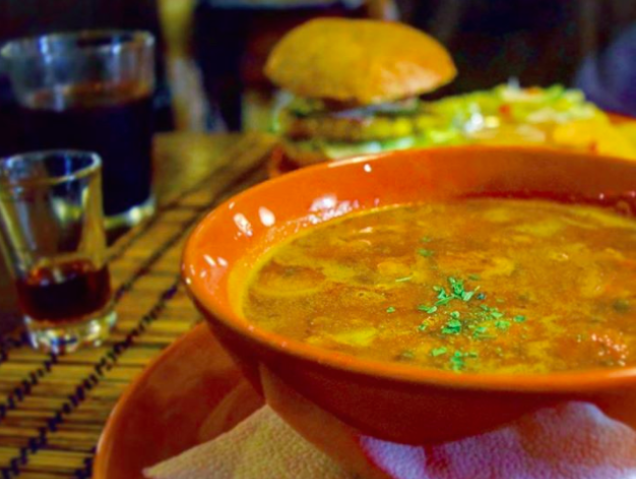 Kozmosz Vegán Étterem is one of the best Hungarian restaurants in Budapest, and they serve Hungary's national dish: Goulash, in a vegan-ified way. They also serve burgers. I wasn't blown away by the goulash that I had there but I'm convinced that's because I had it in the middle of a hot summer. It's a hot dish and is best eaten during winter. The burger I had there was very tasty. I like this vegan Budapest place, it's cute, it's cheap and the food tastes good. It's small - and originally I thought we were in a health food shop, but there's space for about six people to sit and eat. The foods cheap and good, it's a great price to quality/taste ratio. I had the small daily meal (899) and it was so big Tanbay had to finish it for me. Conversely, he had the Hamburger (799) and it wasn't enough for him. (conclusion small appetizers go for the hamburger, large ones for the daily menu). The Hamburger tasted really good, I wasn't so keen on the cheese, but the sauce was really delicious. The daily meal changes every day, I had what was described as 'rice, salad and everything made of soy'. There were three different things made of soy and they were all great. There was one that a cute soy burger with a sweet/sour sauce. Another was similar to a chicken curry, the texture of the soy was so meat like, it was great. My favourite soy part was the breaded soy, again it had a chicken like texture, and the flavour was really delectable. The couple that runs the place are really sweet and if you're lucky she might give you a speech about how we are all one and Western society makes people miserable by telling people they are individuals. Name of the place means the Heart of Heaven. I wouldn't go that far but I like it a lot. 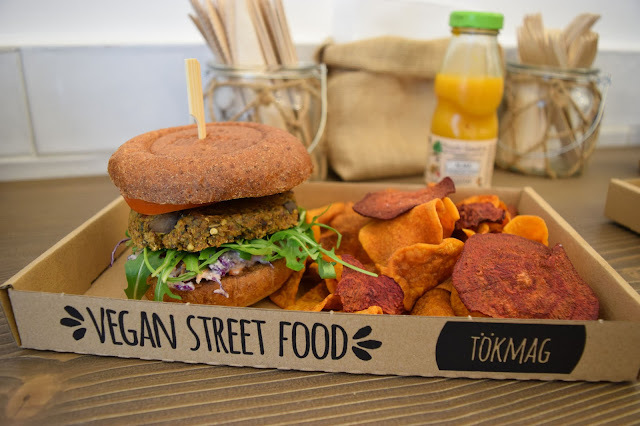 Tökmag Vegan Street Food do nice burgers with sweet potato crisps. In my opinion, the burgers aren't as good as Las Vegans, but they are not bad burgers, the perfect pit stop if you're that side of the city (near Margaret Island). Naspolya Nassolda is in a great location, right in the centre of town near everything, so it's perfect if you need a pitstop for coffee and vegan cake. This isn't really a restaurant it's actually a cafe that does breakfast. Unfortunately, I've found that the cakes seem fall into that annoying vegan cake category of being kind of bland tasting - I'm assuming they don't put enough sugar in them. I don't know about you, but when I eat cake I want it to be fatty and tasty and sugary. Just because I don't want animal products in it does not mean I want it to be gluten-free/ sugar-free/healthy. But the texture of these cakes is really great and they look incredible, definitely go here if you're in the area (which you will be) and are in need of a coffee and cake. Vega City is one of the most popular Budapest vegan restaurants, there tends to be a queue outside of the door every lunchtime! Hungarian students, in particular, seem to love this place. The portions are gigantic, take your own Tupperware pot to take leftovers home with you (they do provide pots, but they're made of plastic). Personally, I find the food here to be a bit 'canteen food' aka the kind of food you eat in a cafeteria. It's not inherently bad, in fact, a lot of the food is very typically Hungarian, but this isn't the place you'd take someone on a fancy date. 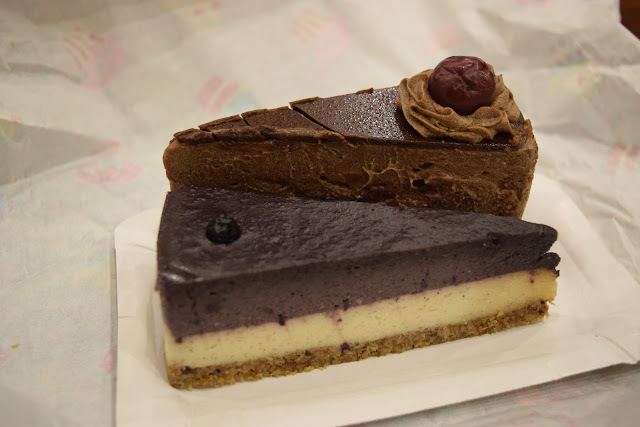 Saying that, the cakes are absolutely incredible, probably my favourite vegan cakes in Budapest. And, the prices are more than reasonable, you can eat like a Queen here for just 2700 HUF, and have enough vegan food Budapest to take home and eat for another meal. I have mixed feelings about Veganeria, I went and tried a pizza and a Mexican type dish, and I didn't like either. The pizza was like a microwave pizza - a big disappointment for anyone who has had vegan pizza in Italy - or really anyone whose had good vegan pizza anywhere (including Budapest). The Mexican dish had a tasty interior, but the outside needed to be cooked for an extra 30 minutes or so. Saying that, best friend and Insta-star Sophie loves this place, she had a different dish and, put frankly, I trust her taste buds more than mine because she's French and has great taste haha. Additionally, this is one of the only Budapest vegan restaurants that serve wine (priorities). I definitely need to go back and re-try this place. Hummus Bar gets an honorary mention. 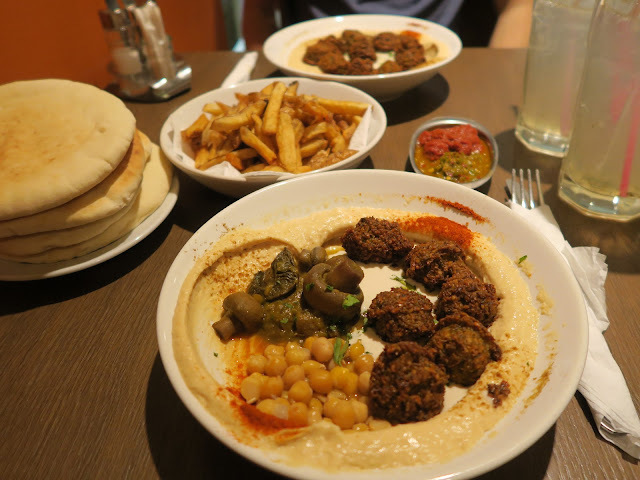 First things first, this is a chain so you'll find Hummus Bar's all across the city. Secondly, and more importantly, whilst Hummus Bar isn't exclusively vegan (it's not even exclusively vegetarian, they serve meat), it gets high praise for having the best hummus and best falafel in Budapest (sorry Falafel Sziget). It's usually quite full and the prices, whilst very reasonable, are more expensive than Falafel Sziget. But I go here at least once every two weeks because it's awesome. Veganeria - one of the only places that serve wine. 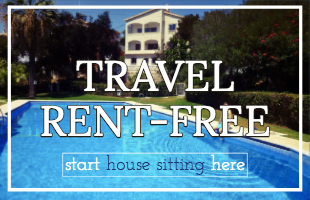 The location is really central (three minutes walk from Szimpla). One Sunday per month a vegan Market is held, usually at Anker't. 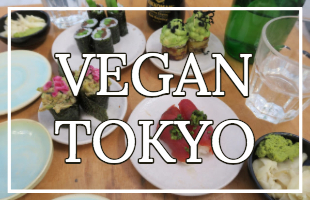 It's a great place to try samples and meet other travelling vegans. There's a surprising amount of vegans in Budapest. There is a growing movement of vegan demonstrations in Budapest, they usually hold up laptops with slaughterhouse footage and answer questions (Vegan Cube). Sometimes they organise marches too. I've been along a few times, and they're all very nice. 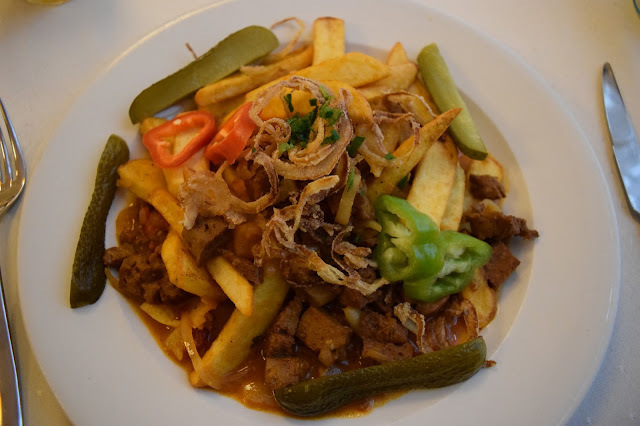 There you have it, a comprehensive guide to vegan Budapest including reviews of many Budapest vegan restaurants. I hope this has been helpful to you, let me know if you have any questions, and if you're in Budapest and want to hang out let me know! I'd love to show you around. 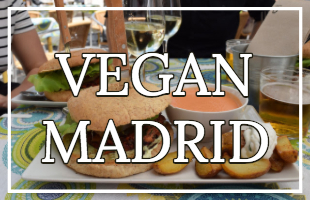 And if you're in the area, why not check out vegan Belgrade a surprising haven for travelling vegans.